We set sail from Venice on the Holland America Line Oosterdam, a tiny ship by our standards, of only 781 crew—and about that many passengers. It caters to an older crowd [like us] and there was no rap music or wild screaming parties. In fact, there were few young folks at all, and fewer children. The entertainment tended to be earlier in the evening [8 pm], so I could actually stay awake for it. Ron greatly enjoyed a small venue called “Lincoln Arts Center” featuring a string quintet; I went for the stage shows. And I made a discovery; if I ignored the over-amped and over-zealous singers and concentrated on the dancers, I had a marvelous time. We had no sooner boarded than the captain called for the lifeboat muster. This was strange to us, as no everyone had boarded yet, by a long shot, but we mustered. 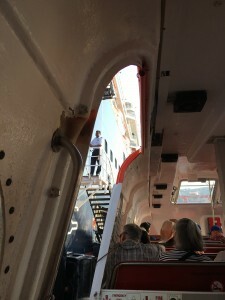 It turned out that our lifeboat was one of the tenders used for shore excursions; we were looking forward to tendering, which will be the closest we can come to taking part in the emergency lowering of the boats. God willing. Our cruise was called “Mediterranean Tapestry.” And so it was. We added 3 new countries to our list this trip. Our first port of call was Dubrovnik, Croatia. 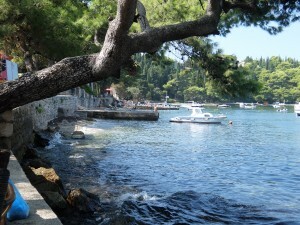 We took a bus tour out of town, which included stops in Cavtat and the Konavle Valley, ending in old town Dubrovnik. Michael, our guide, had an English father and was the easiest to understand of all our guides this trip. As we left the port, the bus labored up an enormous incline to a cliff overhanging the bay and city. Dubrovnik had been a rich port rivaling Venice in the 16th century, a trading mecca and hotbed of spies, as it touched on the Ottoman Empire to the East, yet was a free city-state. It remained Christian and unconquered by the Turks. From our height, the perfect protected bay spread out beneath us, and the honey-gold walls of the old town fort defied any hostile force coming from land or sea. We continued along the cliff, occasionally running lesser mortals off the road, although everyone seemed ok with this. Tourism is the life force of most of the Mediterranean these days, which is not really so very different from the days when exotic goods were brought in from around the world to buy and sell. People still want to go places and buy things. We passed “Adrenalin Park” on the downside of the cliff; we could only imagine what kinds of terrifying pastimes they offered. Equally exciting was the sign for Wild Boar Crossing. The Cousin Vinny ¹ stop was quite nice; an open air restaurant, with servers in traditional dress, who served us ham, a muenster-like cheese, homemade bread and a glass of local wine. This type of ham is available all around the Med, and is a kind of meat jerky, salted and dried, but not smoked or cooked. It is tough and salty, like jerky and served in wafer thin slices. Italian prosciutto is an example. 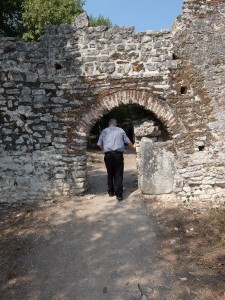 The restaurant was built out of an old mill on the Ljuta River, the lifeblood of the Konavle Valley. The waters ran under the mill wheels ice cold, even on a day in the upper 80s. I put my feet in and Ron worried about the dying fish downstream. 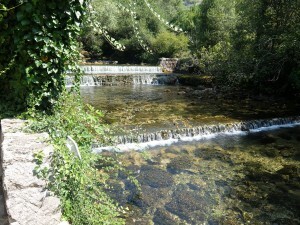 Konavle means “canals” and the valley is irrigated to great effect. Grapes are the largest crop, but we saw maize, olives, citrus, figs and vegetables growing, and a profusion of Queen Anne’s Lace and bright yellow wildflowers. The mountains regularly dump soil onto the valley with the snow melt and the plain is large and fertile. On we went to Cavtat, which is a charming coastal harbor, full of small yachts and a water polo course netted off from the rest of the harbor. Children from the yachts were swimming in the shallows and we found a lovely café to sit at, staring into the clear waters at the curious little fish. Later we learned that water polo is THE sport of Croatia and they regularly win world titles. We made our way back to Dubrovnik by the same eye popping cliff road [adrenalin indeed] and into town. On the way, Ron said he would like to get something lacy for himself in the old town. I burst into laughter, picturing a garment of some type, suitably lacy for a gentleman of his standing. 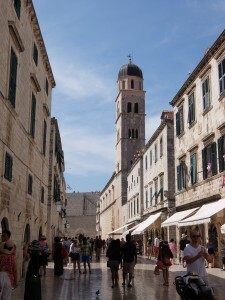 Our day was to finish up in the old town, which was used in Game of Thrones as the set for King’s Landing. Traffic getting in was miserable, but travelers learn to be patient [well, we did]. 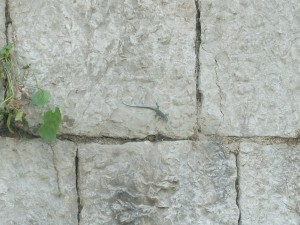 We watched a tiny lizard make his way across the smooth stone of one of the city towers—do lizards have adrenalin? You enter Dubrovnik through a massive drawbridged gate called Pile [pee-lay]. There are only 2 other gates and one was cut in modern times. 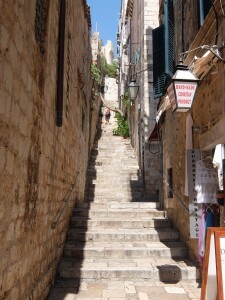 The entire town is made of honey-colored limestone and includes steep staircases up to the defensive walls. They actually charge you to climb what must be 5 storeys to get up there! These tremendous walls were, of course, why the town was never taken. The broad streets are beautifully laid out with drainage channels and the diverging alleyways are built on a grid pattern. Being in the town is like being in a large honeycomb: slippery, breathless with heat, with drones all around you, buzzing into the shops looking for golden treasure, and somewhat stifling. 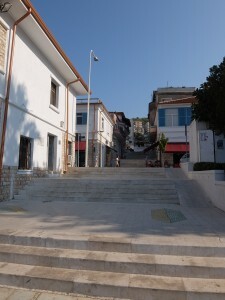 Stairs to the defensive walls of town . Street and buildings all of limestone. Finding nothing affordable, we trudged our way out of the castle to the fresher air of the busy modern square, where we caught our bus back to the ship. The next day, we tendered ashore in Sarande [SA-run-duh] Albania, a charming and alarming procedure, which served to underline the fact that Albania is not quite ready for company. I am actually mystified why the cruise lines go there. But it will be the making of that country. They are on a list to join the European Union as soon as they get a functional and fair judicial system. I cringed inwardly to consider what this must mean to the individual. Our guide was a soft-spoken poet named Leje [e-LEER] Hyrie, sometimes lyrical, often hard to follow. Sarande is a corruption of a Albanian phrase meaning 40 Saints. 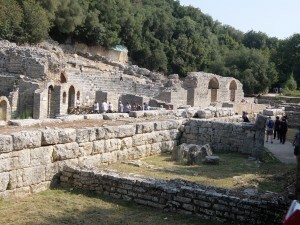 Apparently 40 Christian Roman soldiers were exposed to the elements and martyred for their beliefs. In the 6th century, a monastery was built and named in their honor. 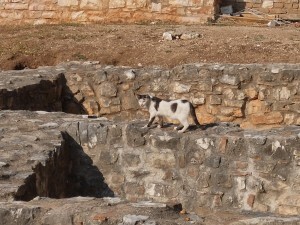 The old town also has the ruins of a Jewish synagogue, wherein I saw the second only street cat of the whole trip. Ron claims it was wearing a little yarmulke, but I thought it was a female. 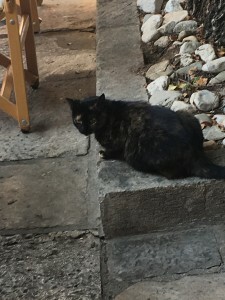 Synagogue cat: yarmulke? prayer shawl? We walked past the famous pebble beach which featured a large number of large men wearing tiny Speedos. Quickly looking the other way, we enjoyed the sharply rising hillside, with quaint shops and restaurants and thousands of steps to get to them. Glad to pile onto our bus, we easily climbed the cliff, quite similar to the one in Croatia and even scarier since the roadway was not as new. Looking down, we saw amazingly posh resort hotels, with stepped patios reaching out over the water, set with lounge chairs and umbrellas. This part of Sarande was definitely ready for company. I wondered if some of this was in place for the old Communist regime bigwigs. As we rose up above the lavishness, we saw the underpopulated and abandoned farms and homes. Leje told us that thousands had left after Communism collapsed in 1991, due to the economic disaster it brought. Though the land and businesses were divided as fairly as possible among those who had been the workers, it was clear that more people were needed to make a go of it. There were signs of vast olive and citrus groves going fallow due to neglect, but it looked like folks were gradually beginning to get things back under control. Goats, the bane and blessing of the Med were keeping everything but the trees mowed down. The goats will eat anything and everything, down to the point where erosion of topsoil has become critical all around the Med. The goats give milk [cheese] and meat [sometimes] but the environmental cost has been very high. It is very unfortunate to note that “shiten” means “for sale.” This is written large on boats and houses and is actually fairly descriptive of some of the properties. The site occupies a circular peninsula that makes it defensible as well as offering great harbors for trade. Now, trees have been allowed to grow up, which was a blessing on a day of upper 80sF with high humidity. There were many bay laurels, creating a lovely scent on the air. We could not really keep up with Leje, let alone hear him well, so we parted company before the group climbed the ramparts. Clever Ron had seen a small area under the trees when people were selling crafts. And it turned out that it was indeed handmade stuff; Ron bought his lacy thing from the lady who made them. It turned out that he wanted a doily. We made our way back along the path, taking more photos and went along to the restaurant which was the meeting point. This was extraordinarily lovely, with shady vines trained over the tables and potted flowers all around. This, of course, gained the unexpected result of bees zooming in whenever food or drink was placed on the table. Brilliant as I am, I got the idea that if I poured a bit of beer into an ashtray that the bees would go to it and leave us alone. Not so! Dozens of bees came over and swarmed the table. We tipped the young waiter to carry away the ashtray. 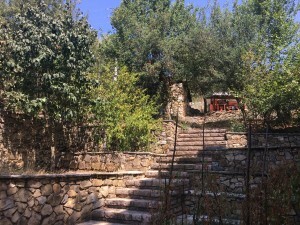 On my way back from the facilities, I wandered through the most wonderful terraced garden, wherein everything was a fruit tree or vegetables. Each terrace was built of native stone; again that honey colored limestone that must comprise the whole of the Balkan peninsula. To my dismay, I was then stuck on one of the terraces, but before I could go back around, another brave and gallant waiter helped me down. If I go back to Albania, I will stay in the town, wandering the steep streets and sitting on the pebble beach with the large old men wearing Speedos. No photos of the Speedos.